8/6/09 We took a picture at this week's clan meeting and uploaded it, here. 6/26/09 Clan Lord is free! Clan Lord is available for Windows! Dwarves may now purchase different-colored helmets (including green)! These updates are still very infrequent! 6/26/09 Dwarven Militia Hunt is every Tuesday at 7:30pm Pacific Time. Meet at the Alliance Castle. 4/10/05 Roster being redone. Clan Lord Java Client (for non-Mac) now available. Free account extensions till 5/2/05. News still updated very infrequently. 3/7/02 Major overhaul of the scrolls underway. Everything is under construction. Menu/header design by Fundin. News updated infrequently. 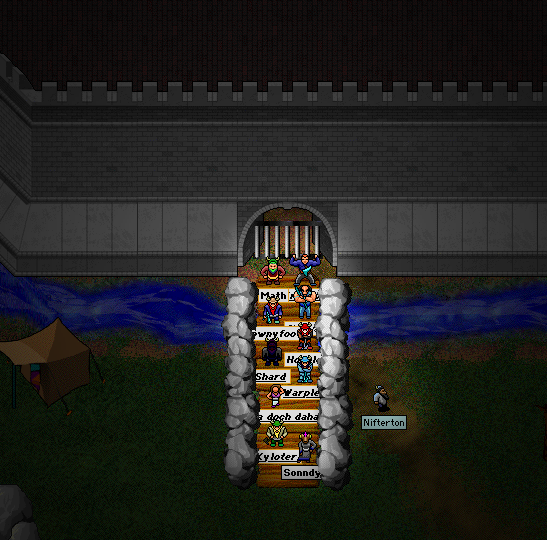 9/14/00 The Dwarven Militia successfully hosted the Dwarven Volympics! 7/14/00 DM T-shirts are now available for a limited time only! 5/5/00 Check out the new scrolls dedicated to Dwarven History. 4/16/00 DM is Dun'ilsar! Woohoo! We defeated Rising Claw in an Arena Battle to become the #1 Clan! 12/3/99 Follow recent events in the DM with The Puddleby Post! 9/16/99 The DM scrolls are finally home at www.dwarvenmilitia.com! 9/4/99 Ptolemy has done it again! Download his latest movie, Beer Trainers! 7/17/99 The Dwarven Militia has hired a builder to build a Brewery! Visit Dorin Beerheart in West Puddleby! 7/3/99 Ptolemy has hacked a movie of DM members hunting with green helms. Download it! 6/27/99 The Dwarven Militia defeats Black Unicorn in a Dun'ilsar competition! Read it in the Puddleby Post! 6/9/99 Just for fun, view an Old Roster of the Dwarven Militia before the Ripture Wars. 6/9/99 Clan Registration opens, and the Dwarven Militia is founded! The founders: Math, Fensaith, Thok Da Warrior, Astral Duck, and Grumble. Thanks to all who contributed to the founding of the True Dwarven Clan! BEER! 5/18/99 The meeting and hunt of Tuesday, May 18 went well. Here is the log of the meeting, for those who missed it. 1/12/99 The meeting and hunt of Tuesday, January 12 went well. Here is the log of the meeting, for those who missed it. 12/18/98 The Dwarven Militia is always looking for good members. If you know people who want to join DM, please have them read these scrolls and then have them contact Warplet, Math, Gimli, Skirwan, or Hoggle. Please do not register them yourself! 12/18/98 These scrolls are constantly being updated. In particular, please check out the members scroll and make sure the information on your character is up-to-date. If it is not, please contact Math. 12/18/98 The Dwarven Militia clan is officially re-registered.